What would you say if we said that you were able to see Neutrinos – small sub-atomic particles – with the naked eye. I don’t think you’d believe us, especially when you consider how much money and ingenuity are spent on building particle accelerators with the sole purpose of detecting some of the tiniest particles of matter. So it will come as a surprise that one of the smallest and lightest of particles, the neutrino, can be observed by anyone with a pair of eyes. In fact, one eye will do. Neutrinos are strange particles, more mysterious than the run-of-the-mill constituents of matter such as protons, neutrons and electrons. Those three types of particle have a mass. Although the electron is 2,000 times lighter than a proton or a neutron, it’s still possible to measure its mass. But neutrinos are so much lighter that for years nobody was able to detect them at all. Scientists believed they had to exist because they were necessary to make some physics equations balance out, but for years there was no known way to demonstrate their existence. if a neutrino comes across normal matter it goes right through it and out the other side. This may seem surprising. It seems the opposite of what you expect. If you imagine a bullet and a peanut fired from a gun at a block of concrete you’d expect the heavier item, the bullet, to go through, while the peanut was stopped dead. The clue to the neutrino’s behaviour lies in the fact that so-called ‘solid’ matter is actually largely empty (see our article What’s stopping us falling through the floor? for more details). So defective is a neutrino in the mass and charge department that it could travel through a light-year-thick layer of lead and come out the other side unscathed. HOWEVER some of the components in that ’empty’ atom have electric charges, and so if you fire, say, a proton, a charged particle, into a collection of atoms, sooner or later it will travel close enough to be deflected and may be absorbed by the electric charges from within the atoms. 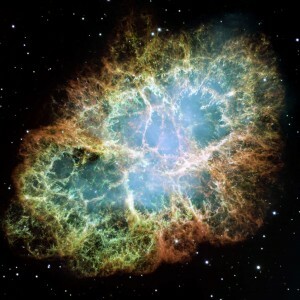 A neutrino, as well has having virtually no mass, also has an electric charge perhaps a thousand times weaker than the electromagnetic forces that affect the more massive and more highly charged atomic particles. So defective is a neutrino in the mass and charge department that it could travel through a light-year-thick layer of lead and come out the other side unscathed. While the chances of any one neutrino interacting with any other particles are very small, there are many neutrinos arriving at the Earth’s surface all the time from the sun. Every square centimetre on Earth facing the sun receives 70 billion neutrinos a second. The vast majority of these pass straight through the Earth and out the other side, but occasionally, if the circumstances are right, an interaction occurs in matter and an electron travelling faster than the speed of light emerges as a result. Hang on I hear you cry … “What business does something have – even if it is as small as an electron – travelling faster than the speed of light? If you know some physics you’ll know that nothing can travel faster than the speed of light ” in a vacuum’. But the speed of light in some other media, “salt-Water’ for example, is normally slower than the speed in a vacuum, perhaps as slow as half the maximum speed, and it’s possible for particles to exceed that slower speed. If they do so they cause a burst of blue radiation, almost like when a “sonic boom” is created when something travels faster than sound. 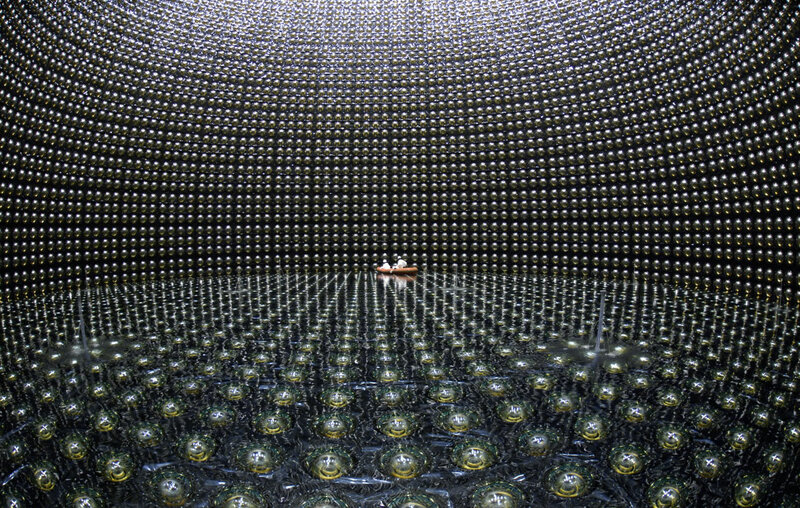 To detect neutrinos, scientists use a very large container of some dense transparent substance, such as heavy water or sometimes, dry-cleaning fluid. Since every part of the Earth is bathed in neutrinos all the time, if physicists wait long enough for the right combination of circumstances they sometimes detect the telltale burst of blue radiation that can only be due to a neutrino interacting with the transparent substance. So what about the idea that the human eye might be able to detect a neutrino? Well, it’s all a matter of probability. The eye acts like a tank of a transparent substance which could experi-ence the same burst of radiation if just one of the 70 billion neutrinos passing through it in a second were to trigger the effect. Occasionally, the Earth is bombarded with neutrinos from farther away than the sun, from an exploding star knownas a supernova. As a result of such an explosion in 1987, it’s been estimated that between one and 5,000 people would have experienced a neutrino ‘event’, and if the site of that event was the eye, a handful of them would have seen the blue flash that marked the passage of the neutrino. It’s likely, therefore, that the everyday neutrino bombardment of the Earth will cause a similar blue flash in the eye of someone, somewhere, at some time. But the chance of anyone noticing it, reporting it and claiming a neutrino sighting is somewhat slim.